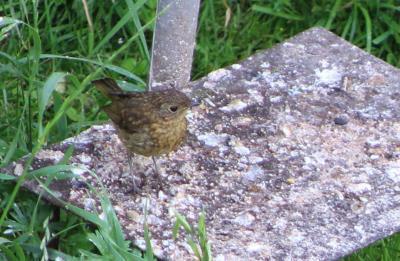 Bird Id - Forum - Identifying Birds - Is This A Juvenile Robin Or A Dunnock? Forum > Identifying Birds > Is This A Juvenile Robin Or A Dunnock? 2 Hi Guys, This is now my second posting as when I posted it first time....I didn't!! I'm new to birding and started an interest when I moved to a new house with loads of feathered visitors. I am not very good at recognition as yet and this little fellow posses me a problem. Info' online seems to point to either a juvenile Robin or a Dunnock. We have both species of adults in the garden so I am stumped. 2 Hi. I have a sneaking feeling that it is a Robin.